The morning of May 12, 2017, as my wife and I turned from Cleveland to walk down Meade Ave., a flash of Siamese sped from the sidewalk into a heavily-foliaged front yard. As we passed, the feline slipped out behind us down the sidewalk towards the corner store. 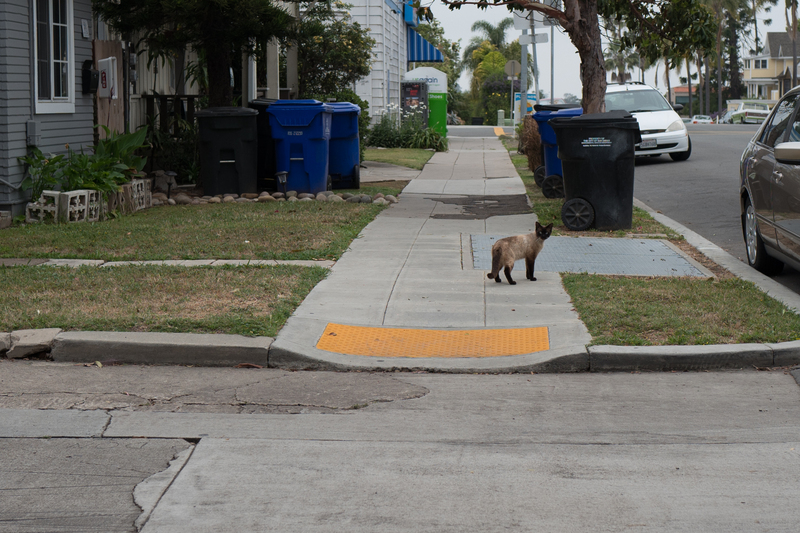 Weeks earlier, a similar—and likely the same—cat disappeared likewise, but on Cleveland rather than Meade. As I crouched down with the Leica Q, the furball turned to see who (or what) pursued, presenting the only profile shot. The full-frame sensor and 28mm Summilux lens deliver tremendous detail. The Featured Image is cropped around 100 percent, and perhaps a little more. Vitals: f/2.8, ISO 100, 1/800 sec, 28mm; 10:48 a.m., PDT. Also in this series: Scruffy, Roly Poly, Woo, Skull, Biscuit, The Colonel, White, Chipper, Frisky, Stretch, Needy, Farfisa, Mates, Hunter, Pee-Pee, Blue, Blue Too, Bonded Pair, Patience, Fess, Jumper, Frenemy, Looker, Cozy, Scout, Lurks, Skit, Mini, Betty, Black and White, Stalker, Bell, Chill, Sammy, Scratch, Poser, Star, Grey and White, Watcher, Herman, Comet, Roman, Willow, Chub, Nimbus, Watson, Lilo, Kit, Pepe, Twilight, Sebastian, Spot, Booger, Ash, Veruca, Riley, Mellow, Bonde, Flower, Glass, Black, BeBe, Fang, and Bruce.